› Author AffiliationsFinancial support from the Australian Research Council is gratefully acknowledged (DP180100845). A range of 7,9-dimethoxypyrrolo[3,2.1-ij]quinolines have been prepared by the cyclisation of 7-formyl-1-diethylcarbethoxyindoles. The functionality at C5 has been varied by the conversion of the carbethoxy group into carboxy, azidocarbonyl and isocyanate groups. 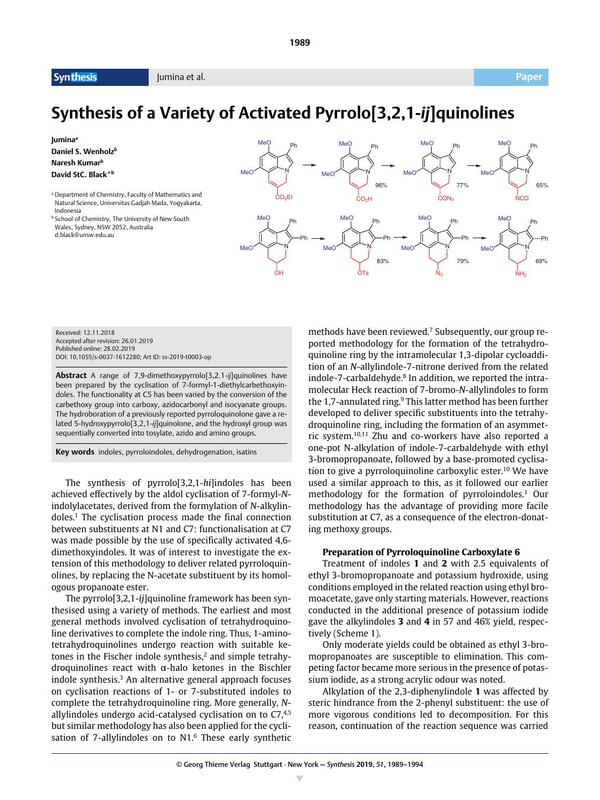 The hydroboration of a previously reported pyrroloquinolone gave a related 5-hydroxypyrrolo[3,2,1-ij]quinolone, and the hydroxyl group was sequentially converted into tosylate, azido and amino groups. Supporting information for this article is available online at https://doi.org/10.1055/s-0037-1612280.